Here is everything dealing with the base Object. 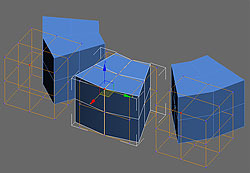 Attach: Similar to Edit Mesh "Attach"
...List: Similar to Edit Mesh "Attach List"
Lock Stack: This switch locks the stack to the base object; checking this allows the Modifier to be edited in all subobject modes, but the modifiers in the stack above always refer to the base object. This is very useful if you want to edit MeshAK below some other modifiers, and don't want the modifiers above refer to subobjects while you edit. 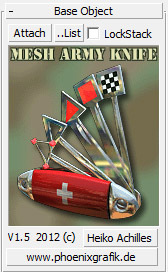 The following pictures show a Mesh AK modifier on a box in vertex edit mode, show end result toggled on. There are three instances of this box. On all three instances lies a bend. 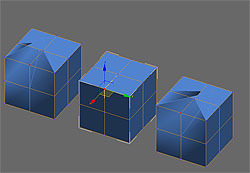 In the first picture, Lock Stack is switched off, and the bend refers to the selected vertices. In the second picture, Lock Stack is switched off and the bend always refers to the base objcect. If you now move verts, you can nicely see how it will look in the end result.